At Capitalize My Title (capitalizemytitle.com), I believe in being as honest and transparent as possible. Some of the links on this site are affiliate links. That means that if you buy a product I mention, then I get a small commission. It helps out the site and doesn’t cost you anything. Amazon Services LLC Associates Program: An affiliate advertising program designed to provide a means for sites to earn advertising fees by advertising and linking to Amazon.com, Amazon.co.uk, Amazon.de, Amazon.fr, Amazon.it, Amazon.es and Amazon.ca. 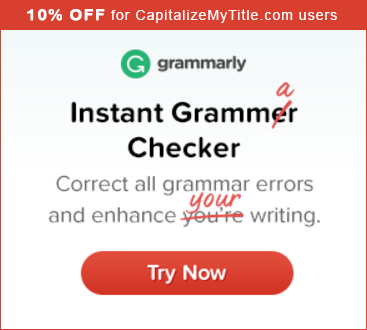 Grammarly: I have been using Grammarly for years and love recommending it on this site. That means if you click on my Grammarly links (both in the review and on the homepage button “Check My Grammar” as well as anywhere else on the site) and download either the free or premium service, I get a commission. Please know that I either do or intend to place ads on my website from a variety of advertisers. I may also show ads from Media.net or Google Adsense in the future, too, the latter of which can be displayed both inside of articles, above and below articles or in the sidebar. Typically, these ads are marked with an “Ads by Google” notation. I also intend to include links to websites or products in which I receive compensation for completed applications or purchases by visitors. Please do note, however, that above all else, I’m here to help inform, educate, motivate, inspire, and aid you in reaching your goals, so any website or product that I may link to is only done so with the mindset that it will help serve my visitors in a positive way. Please understand that I do also provide links to websites, products, and other resources of which I receive no compensation. My mission statement is clear, and my commitment to my visitors is of the utmost importance, but this is in no uncertain terms a for-profit website. If you have any questions, please fill out the “Contact Us” form above and I’ll get back to you as soon as possible.